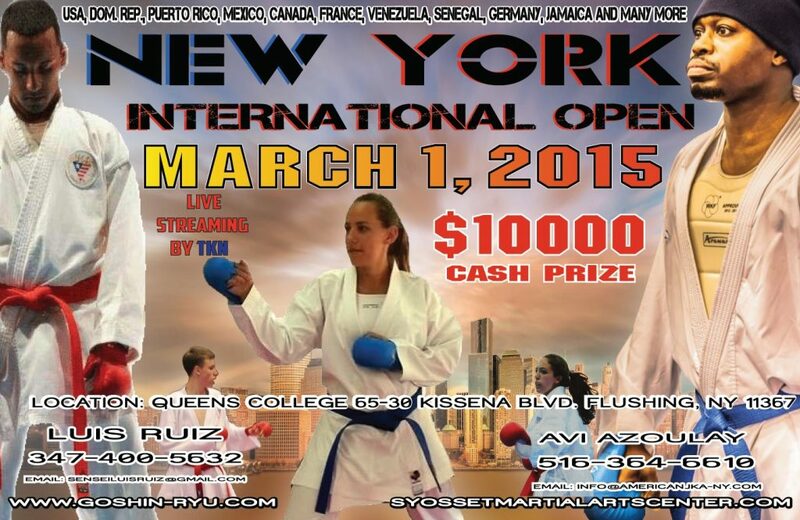 It`s a pleasure to invite you and your students to the New York`s 2015 International Open. The championship will take place on Sunday March 1st at Fitzgerald Gym, Queens College, N.Y. Located 65-30 Kissena Blvd Flushing, NY 11367. This is a special year because for the because our tournament has grown to international recognition, and it’s known as one of the biggest events in the USA. We would like to thank you for your support throughout the past years, without you, this event would not have the high quality competition we have become accustomed to. In past our competitors arrived from, France, Puerto Rico, Venezuela, Canada, Dominican Republic, Nepal, Trinidad, Switzerland, Jamaica, Iran, Germany and Schools from all over United States. We have official confirmation that they will return. And in addition we have extended an invitation to other countries and States, and have gotten great responses. This 2015 Tournament is sanctioned by USA Karate & the New York Traditional Karate League (NYTKL). We will do everything in our power to make this tournament a great experience for you, and it is from the hearts of our event organizers, Luiz Ruiz & Avi Azoulay, that we hope to see you at the largest & most unique event in New York City.